Each Step Led to This Dai… UW GRAD 2018! I finished school a few months ago in March and since then I’d been patiently awaiting my official graduation ceremonies that would commence in June. I spent time visiting family and evens started a brief part time job tutoring and cherished my new relaxed pace of life remembering my vigorous schedule from college. Oh yes I remember waking up to a to do list of “class, class, study, office hours, practice for interviews, homework, midterm practice” and then sleep and do the whole thing over again. I put all of my energy into making sure I did everything I could to get the best grades possible and secure a job for when I graduated. The actual graduation ceremonies would signify that I was completely and totally done. My college experience would come to an end. My time off has been a break long needed and deserved. 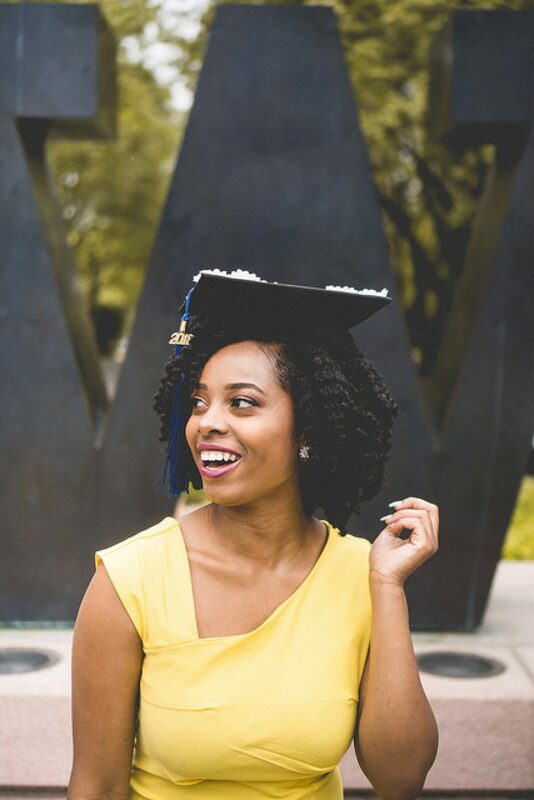 I loved being able to plan out my graduation photoshoot and all of the exciting details without having the stress of studying for classes and finals. Eventually June 3rd rolled around and I was so happy I was finally going to walk the stage after 4 years of hard work! I spent my entire Saturday watching the latter half of season 3 of Parks and Recreation and doing the twist out of my life. It took my 5 hours to do my hair. Small, precise twists with no gaps, tangles, or bulges. I fell in love with Shea Moisture’s Red Palm Oil and Cocoa Butter stretch pudding. After my grad photo shoot, I knew it was going to be a twist out product staple. Anyways, I was confident that my hair was gonna be poppin’ for my very special day. I answered as many last minute questions from frantic and excited family members as I could. But overall I was focused on maintaining a relaxed mood and taking the experience in. That morning I woke up an hour before my alarm. My stomach started pulsating and my heart was beating fast. I was so nervous and excited. I always wake up early when it’s a big day for me. It wasn’t an interview, a big test, or anything I had to endure over the past 4 years… it was MY GRADUATION! When it was finally time to get up, I did yoga as usual but this time my eyes began to water as I began to contemplate how hard I worked, the obstacles I faced, and how much I dreamed of this day. For many years it seemed so far away but I was finally walking through the end of the tunnel to experience the light. I thought back to 3 years ago, freshman year. I was taking my remaining prerequisites to get into the business school ranked #1 in the PNW and #14 in the nation for public universities. I was ready to take on the challenge and knew that that was where I belonged. I worked long nights, went to tutoring almost every day for Math 111/112 and breezed through Stats 220. I was so happy for the Daizha that was crushed after BARELY passing the Econ 201 and 200 prerequisites. I could clearly remember how anxious I was thinking about having to choose a backup majors just in case business school didn’t work out. I thought about how vicious the curves were in weed-out classes like ACCTG 215. I had an extra prep class at 7 IN THE MORNING *now i could never see myself taking an 8 am class in my entire life* but I sacrificed a comfortable start time for extra practice for accounting. And when I submitted my application I checked it over and over again before submitting only to have to wait for an entire month to find out the results. As I waited for the results, I had to calm myself down as my heart raced each night thinking about if I would have my dream of being in the business school. Fast forward to June 3rd, I was in my room, doing yoga and preparing to graduate with a bachelor’s in Business Administration majoring in both Marketing and Information Systems! I was so excited to get to the stadium. I tried to eat as much as my nerves would allow me but don’t worry, I had some snacks in my purse lol. I saw some people I never saw in my life and some familiar faces from group projects I’d had over the years. I found my front row squad and we walked around to find our entrance. I could hear the crowd buzzing and we actually were about to start. I was one of the first people to walk out and the energy was amazing. I saw and heard my family cheering for me! It was an amazing experience. The ceremony just about flew by and I walked across the stage with a huge smile on my face and a twirl for the gawds. Even though it was cold and rainy at first, it made me feel so good that my family planned and decorated for my graduation beach party. I felt warm on the inside no matter the weather. It just felt good to be celebrated and congratulated for something I worked for. I loved my mom’s idea of every guest going around in a circle and saying their memories, thoughts, and favorite things about me. Words mean a lot to me. I’d say words of affirmation is my love language. And hearing how I’ve made others feel and all of the nice things my friends and family had to say about made me feel so special and appreciated. I will always look back at that video when I need it. I had a some days in between my first and second graduation. I was just having a pretty awesome week. I got to show my dad around Seattle for the first time and spend time with him while he was here. I had so many leftovers from my grad party that I’m still craving till this day. But low and behold it was time for Black Graduation 2018! I would finally be one of the black graduates receiving their kente stole. This day was a little hectic in the beginning I must say. Nails falling off, couldn’t find my preferred lashes, unexpected things, more rain, etc. I was feeling a little off for a minute but once the ceremony and speeches started I was just like ” oh well let’s just enjoy this” and decided to be in the moment. It was still a good week and the celebration must continue. This graduation was special because I was with all of the black students I experienced UW with. It’s a small small world as a black student at a PWI so it was beautiful to have a celebration just for us. I had fun on the stage too! Peep the video below lol. The next day was big graduation with all of the graduates from the entire school, from bachelor’s on up to doctorates. Tons of people had been saying how long and boring the graduation would be or had been for them but I was still determined to go because you only graduate from university for the first time once. The rain held out this time for a while, thank God, because it was on the football field. I was literally running to my entrance so I wouldn’t miss the walk out time but I made it! I was so HYPED seeing how a huge football stadium filled with people all excited. I was so so happy to see my mom stand up and cheer for me in that huge crowd as I walked in. It was my final graduation of the week. This one was for the college experience as a whole. This stage in my life of so much growth and accomplishment. I was celebrating all of that. All of the departments sat with each other and when it was time to present the business school, we were formally granted our degrees! OFFICIAL OFFICIAL OFFICIAL. A pleasant surprise was actually walking the stage to shake hands and receive my beautiful degree case. I thought we were only going to stand up and sit down but yay I got to walk the stage in the stadium. Literally this day was just so fun and the ceremony didn’t feel long at all. At the end, when the seats were almost empty, I gazed the entire stadium and took a deep breath. I really finished. The chapter was completely over. And I was like wow I’m actually going to miss this school. My eyeballs started watering again lowkey (aka crying) but it was like saying goodbye to an era where I became the adult me. I really took my whole life into my hands and learned how to take care of myself on my own. And now my life really changes from here on out. I came in with a mission and I completed it. A college degree is a privilege that I am so grateful for and I don’t take lightly. It means so much to know that I can take care of myself financially and have the career that I’ve dreamed of having.Generational poverty no longer can have a hold on my lifeI can be a role model for my younger families and they can see that it’s possible to go to college, to travel, to take risks, and to do anything they want to do! I am so blessed to have had the opportunity to receive a degree from a 4 year university. I’m grateful for all of the challenges, trials, and tribulations that I experienced while in college and because of college because they made me even an even stronger person. Graduation season was everything I could’ve imagined and even more! Through the ups and downs I know that …. Each step led to this, Dai. Congratulations…. 💃💃💃So happy for you.